International Journal of Research in Health Sciences,2014,2,1,68-78. 1Research scholar. 2Research Director, Little Flower Medical Research Centre (LFMRC), Angamaly. The need for vestibular stimulation can be observed throughout the life from newborns and infants in the cradle to the aged in a rocking chair. Everyday activities such as running, dancing, swinging, falling aside, or driving cars may exert positive and negative effects on subjective well-being. A thorough review of literature revealed that vestibular system is having extensive interactions with hypothalamic nuclei, autonomic system, dorsal and median raphe nuclei, substantia nigra, hippocampal formation and modulates endocrine secretions. The purpose of this article is to review research reports related to role of vestibular stimulation in modulation of endocrine secretions and to suggest translational research in this area. 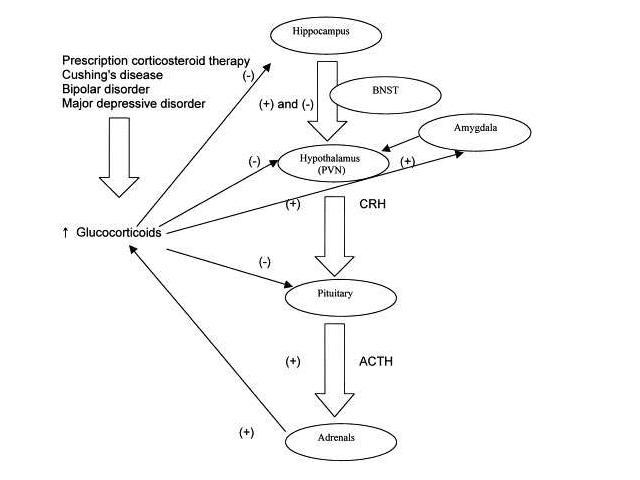 Diagrammatic representation of the interactions between hippocampus, amygdala, glucocorticoids and hypothalamo-pitutaryadrenal axis.